This beautifully furnished Duplex cottage (main floor ) cottage offers 1300 square feet of living with private driveways and entrances on a 2 acre treed property in the heart of Georgian Bay.Constructed 2016-2018, this is truly an outdoor enthusiasts paradise with cycling, skiing, water activities, hiking, fishing, just minutes away! Ski at one of the many resorts in the area including Blue Mountain all between 13- 20 min drive. Minutes from the Bruce Trail on the Niagara Escarpment which is a popular attraction for hiking and cycling enthusiasts. Access for Cycling on the Georgian Trail is just a few minutes down the road. 5 minute drive to a small private sandy beach and two other beaches within the same distance offering playgrounds (some sand and pebble). This area has both incredible dining and shopping and quaint streets for strolling or grabbing a coffee at a locally owned coffee shop. Local vineyards provide tours and tasting as well as a local cider/brew house. This location is also perfect if you just want to kick back and have a relaxing quiet vacation. Rent one or both units if you require more space for your gathering at a discounted cost. Entire cottage is 2600 sq ft. Unit 2 is a 2 bed 2 bath . The house has a bright airy modern/cottage feel from the white wood cathedral ceiling in the Great Room complete with a gas fireplace for those cold days. The Master Suite includes large walk in closet, and a 3 piece bath with a stand up tiled shower stall . 2 other bedrooms share a bathroom. 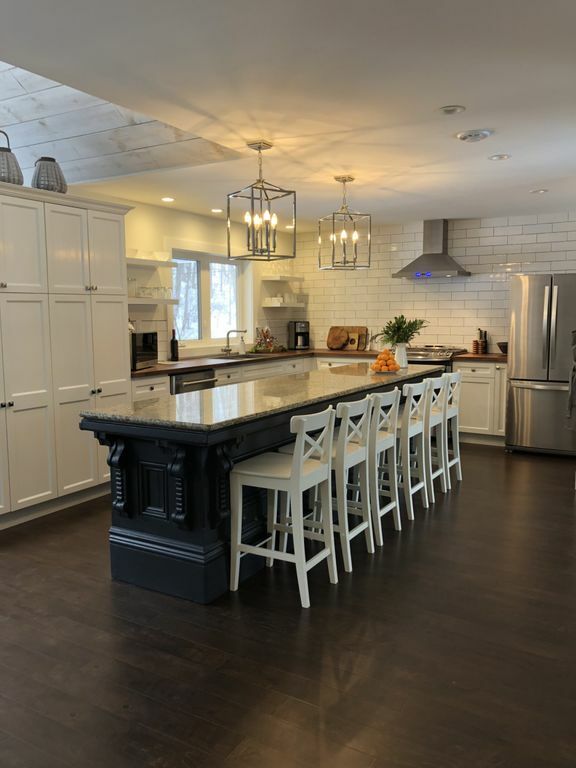 The eat in kitchen is bright and large with a 12 foot granite topped island with seating for 6. Heated floors throughout. Enjoy one of the 3 covered porches to have a BBQ or even enjoy the sunshine in the winter months. We have put in a Regulation Size Sand Volleyball court Spring of 2018, Fire pit surrounded with Muskoka Chairs and a couple of kayaks and bicycles available for your enjoyment during the spring and summer months. No smoking inside or within 12 feet from building . No parties. We will not accept reservations for anyone under 25. This property was the ideal location for our annual girls weekend. Lianne has considered every detail when putting together this space and gone above to provide all the creature comforts. Although we didn’t get a chance to meet in person, Lianne was attentive to anything we needed during our stay, quickly answering any questions we may have had about the space. Overall we were thrilled with our experience and cannot wait for our next visit! We spent part of March Break at this lovely cottage. It's the perfect rental: spotlessly clean, beautifully decorated, with a very friendly, accommodating hostess who's thought of everything, including a well equipped kitchen and great beds (the weather/time of year prevented us from using some of cottage's fun "accessories" – bikes, kayaks and fire pit). As advertised, it's a short drive to Thornbury (some great coffee shops and restaurants) and 15 minutes to Blue Mountain. A great place we hope to stay at again. We loved the home. It was very comfortable and well cared for. The owner met us at the home to give us the key and a tour of the house and amenities. She was very friendly and helpful. We enjoyed our stay very much and will recommend it to others. The only issue we had was that the water in the guest bathroom did not get hot enough. Beautiful new cottage, impeccably decorated, with a welcoming owner just minutes away. Our family of four had a wonderful visit to the Blue Mountain area with this cabin as our base. The owner met us at the cabin to welcome us and make sure we were oriented to the property and the area - she was so very friendly and helpful. We would love to stay here again for our next adventures in the area. Well appointed home with all the comforts. Great location between Meafird and Thornbury. The owner was helpful and accommodating throughout the process. Great place for a family and couples.